The weather looked ok this past weekend, so we planned on spending an afternoon on the beach at Moraine State Park. A huge downpour started as soon as we arrived, so we ended up going for an aimless drive. I happened to notice the sign for the Rock Point Yacht Club in Ellwood City, and remembered that this was the site of an old Trolley Park. I had heard that some of the most well preserved ruins from a park of this era remain here. Needless to say, the results did not disappoint. My only regret is that the thunderstorms and torrential downpours prevented us from further exploring this site. We will definitely be back here at some point. In advance I thank rockpointpark.com for pointing me in the right direction for an adventure, and Lawrence County Memoirs for some more in depth information on the rail history of this location. The entire area has essentially been left to grow back since the park closed back in 1911. The land has been open to the public as a natural area thanks to the Wild Waterways Conservancy, that purchased the land back in 1996. Prior to this, the Nastas family had purchased the land in 1940 with the hopes that the state would eventually acquire the land to create a natural recreation area similar to McConnell's Mill State Park. I would not mind seeing this happen, but the Wild Waterways Conservancy has a great thing going with this natural area. I would love to see it opened up to more recreational opportunities. It is a wonder that there is anything remaining from the park after a century of sitting and deteriorating. Here are some railroad ties. I am not sure if these have been torn up from the area, or if they are for a project in the little picnic area/boat launch area that is set up here. At the top of these rocks is what is known as Rock Point, the natural site for which the amusement park was built around. The point looks out over the Connoquenessing Creek Gorge at the creek's confluence with the Beaver River. This is a rugged area that looks to have some pretty great hiking opportunities. The waters were running really high from the downpours at that point, and the heavy rains throughout the week. The park was built up by the New Brighton and New Castle Railroad Company in 1886, a part of the Pennsylvania Railroad. A tavern built in 1836 served as the starting infrastructure in the park. A few years prior the tavern was purchased by a doctor and turned into a health resort based around a set of mineral springs. There was a craze in Victorian times for these mineral springs for it is thought that they had healing powers. Another one of these mineral springs exists in Raccoon Creek State Park, where that too was turned into a health resort in this same time period. As a railroad park, the train would stop just prior to the entrance of this bridge. This bridge dates back to 1903. It is currently utilized by Norfolk Southern. I never noticed an old telegraph line holder off of the side of a railroad bridge like this. Now for the coolest remnant of the park, a nearly intact foundation from the Shoot-the-Chutes ride that was built in 1904. I am not certain how many foundations of these remain intact, but there cannot be too many. This is a pretty impressive feat for something that has been around for more than 110 years, and in abandonment for 104 years. That is nothing short of spectacular. I have to get back to this place and explore some more. The oldest Shoot-the-Chutes ride in operation is the Lake Winnepesaukah Boat Chute, which dates back to 1927. 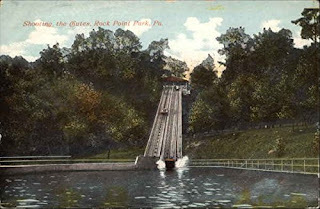 Kennywood's 1901 Old Mill (Garfield's Nightmare) once had a Shoot-the-Chutes drop at the end of the ride and is probably the closest example we have to what existed at Rock Point Park over a century ago. It amazes me that these concrete troughs are still intact after so much time. It seems that this park had multiple issues that led towards eventual closure. The biggest of which seems to have been an oversaturated market in local amusement parks. There were dozens of parks dotted all around the region. Neighboring Beaver County had three trolley parks of its own, including Junction and Morado Parks in Beaver Falls, Aliquippa Park, and Woodland Beach in Ashtabula, OH. At this point the Pittsburgh Railways trolley parks were still in operation, which included Kennywood, Southern, Calhoun, and Oakwood Parks, all within or near Pittsburgh City Limits, keeping local Pittsburgh picnic crowds in town. 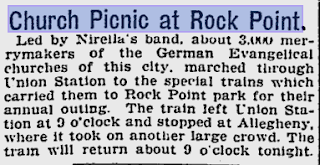 The Panic of 1910-1911, a slight economic depression, also sealed the fate for multiple parks that were on the brink, likely leading to the decision for the Pennsylvania Railroad to stop service to the Rock Point, the decision that ended up closing the park. Parks like Kennywood, West View, New Castle's Cascade, Youngstown's Idora, Conneaut Lake Park, and others, eventually began to thrive. These parks drew from the same Pittsburgh market, but also had larger local cities to draw crowds from. This would prove to be the difference maker, for the Pittsburgh crowds, especially in the midst of an economic crisis, were simply not enough to sustain the park. 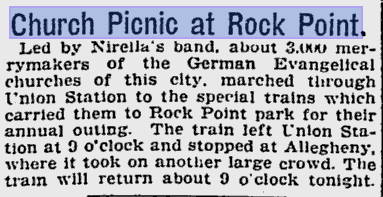 Additionally, this park was considered to be primarily a day trip destination, even with Rock Point having a hotel. Conneaut Lake Park up north was another railroad park that was coupled with a resort area in which people would spend multiple days up to weeks at a time. I have to get back to this place to explore some more. It seems like a great place to picnic, hike, and launch a kayak into the river area. There is also one of the most intact sets of ruins around from any abandoned amusement park between what I have seen, and the other things that I have seen through the park experts at the Friends of Rock Point Park group. In having sat idle for more than a century, this place has more remnants than parks that have closed in the last few decades. 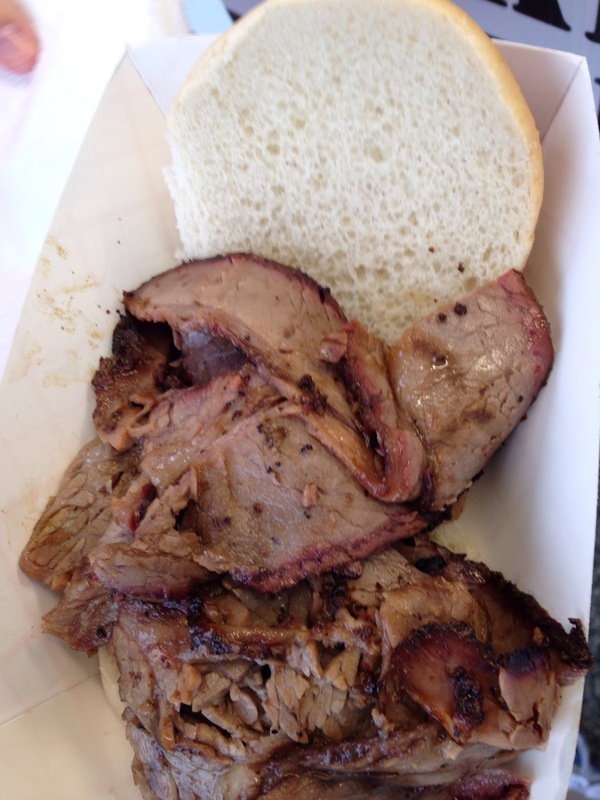 One of our favorite traveling food trucks in Pittsburgh is the Pittsburgh Smokehouse. Their beef brisket is amazing. We will often check to see where they are located on any given day and visit that spot. 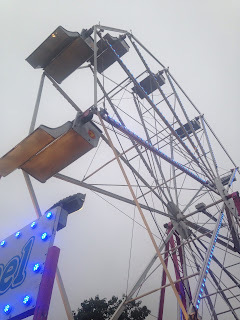 This weekend they were at the Wilkins Summer Festival, a nice little carnival located in Wilkins Township that is celebrated in the middle of June. We had to run some errands and Brit surprised me with a stop here. Barbecue and rides? You can't go wrong! 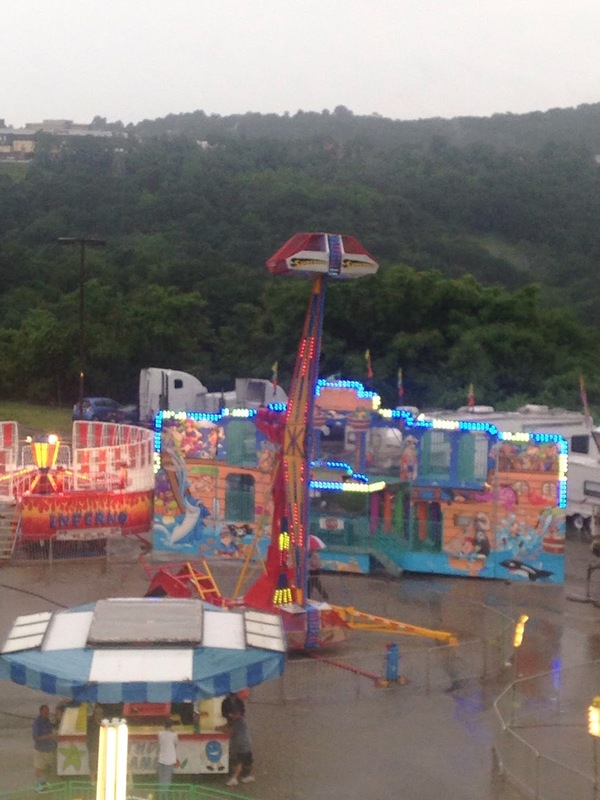 The weather was miserable out, but they still ran the rides! Naturally my eye went right towards the good old Roll-O-Plane. These Eyerly creations are awesome! Eli Bridge Ferris Wheels always catch my eye too. I wonder how many of these are in existence? It seems there are tons of them. Durable old machines. I always enjoy rides on these. 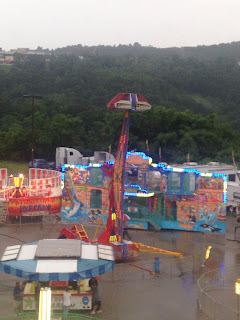 The view from the top of the Ferris Wheel of the midway, including the Roll-O-Plane and a Round-Up ride, and the Turtle Creek Valley in the background. Naturally Brit wanted to win a goldfish. We won two, RIP. The Wilkins Summer Festival was a great little community event. I wish they had better weather for their Saturday, but we will definitely check it out next year. 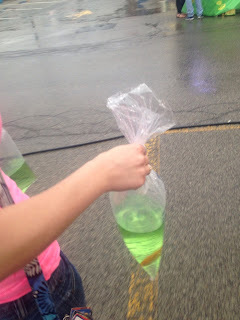 This weekend we visited Conneaut Lake Park, and as always, we had an awesome time. We made the trek up from Pittsburgh to spend a relaxing afternoon at the park. The slow but steady improvements at this park show on every visit. This is our first visit in 2015, but even last year over a period of weeks you would see improvements. The park looks cleaner, more rides are in operation, and the rides are running better than ever. 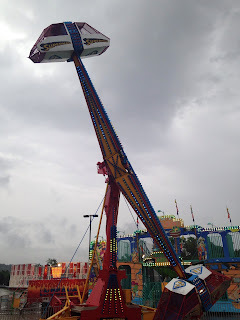 One of the best things about Conneaut Lake Park is that you can have a relaxing day at an amusement park for an all day ride wristband rate of only ten dollars. On the second Sunday of each month the park sells the wristbands for only 5 DOLLARS and on some days they even let grandparents ride with their grandchildren for free. The pricing is great for a park with some excellent rides and natural beauty. While the Flyers are being rehabilitated, and the train getting closer to operation, the Tilt-A-Whirl has been fully restored. The beautifully wooded midway of the park. You really feel like you are in a forest when you visit the park. Many of the trees appear to be pushing a century old. More on that later in this post. Onto the Tumblebug! Boy was this thing really powerful! This is one of only two Traver Tumblebug rides remaining in operation, with the other being the Turtle down at Kennywood. This Tumblebug rides like the thrill ride it was originally designed to be. The airtime was great, and if you did not hold on, you were tossed around the circular car. As has been the case since 1938, the Ed Vettel designed Blue Streak rules the park. This coaster rides better and better with the full rehabilitation work that Lenny Adams has put into the ride. The backseat airtime on this demon is as good as any out there. Normally the first drop packs the strongest punch of airtime on the ride. On this visit the first drop packed as much ridiculous ejector airtime as it usually does, but the second drop packed an even more powerful punch. I probably rode this about a dozen times, and got to meet Brian Lyautey. As I was mentioning earlier about the age of the trees, Blue Streak is a pretty tall coaster in the 77-80 foot range. Normally there is a set stat on how tall a coaster is, but different sources state different heights for the ride. Anyways, notice how the trees have a good 25 to 30 feet on the coaster? That puts these trees as high as 110 feet. I believe these are oaks, and that puts these trees as more than a century old. I am not sure if they were planted when the park was opened, or if they were there before the park opened and kept. There is a very good chance that these are old growth trees. There is a confirmed old growth forest in one of the game lands near the park. There is a good chance that these may be old growth as well. If they are or not, they really are beautiful trees. Here you can see the moment right before the train crests the hill and you feel like you will get launched to the moon. Boom! Blue Streak is such a phenomenal ride. With this, I have ridden four of the five remaining coasters with NAD trains, with the other three being the Kennywood Thunderbolt, and the Camden Park Big and Little Dippers. The only one left for us to ride is the Rye Playland Little Dipper. The park's T.M. Harton carousel is a real stunner. It is also one of the only things left intact of T.M. Harton's legacy. He built this in 1905 and in 1906 he opened the famed and sorely missed West View Park near Pittsburgh. The Blue Streak coaster is also one of only two coasters remaining designed by Ed Vettel, the same guy that designed the Bobs and Racing Whippet coasters. I love the murals of historical scenes around Conneaut. Next up was the Devil's Den. I helped with restoration of this a few years back. I am glad to say that the park has improved the scenes quite a bit, even since last year. It is really looking great. This is one of only a few Gravity fed Pretzel Darkrides remaining. Another can be found down at Camden Park. Home of one of the best entry warnings in the business. Now that is my kind of safety spiel warning! Conneaut Lake is Pennsylvania's largest natural lake. The beach area looks great. We will have to get back later in the summer and do some swimming. And one more ride on the Tumblebug! I highly recommend taking the time to visit this natural and historic gem of a park for a relaxing and affordable getaway. Today we take a look at the Roller Coaster Race at Kennywood. This was a pretty awesome event that I hope become an annual tradition. It was nice being at the park at the crack of dawn, seeing hundreds of people come out to run through the midways of the park. For those of you who raced, message me through our Facebook Page, or through my email and I can send you a picture or two of you racing. I got most of the runners, so message me your racing bib number, which race you were in, and what color shirt you were wearing. Mile 3 for the 5K, and just beyond mile 6 for the 10K race. This part was the final approach to the finish line. A dormant Garfield's Nightmare, one of the oldest rides in the nation and one of the last remaining Old Mill rides. Mile 6 for the 10K participants. Jack Rabbit test running while its riders are out running themselves. Now to the park's mystery project. Many rumors are circulating about this. The rumors say that this will be a 4D darkride or theater production. The only thing confirmed is that it will not be tied to Simpsons branding. They were hard at work on this new attraction. This photo was taken around park opening and the next photos were taken in the afternoon. I am intrigued as to what this will be. After getting my first ride of the day on Sky Rocket, I headed over to the ride that is tied for my favorite steel coaster of all time, Phantom's Revenge! Thunderbolt beckons while I wait for my front seat ride. Thunderbolt's NAD trains always look so awesome. Phantom riders plunging 85 miles per hour on a 227 foot drop down a giant cliff. The world's tallest terrain coaster is one of the most awesome coasters ever made. Meanwhile, Thunderbolt is getting ready to take its own large plunge down the cliff right out of the station. The coolest thing about Kennywood is how eccentric and unique the layouts of the park's coasters are. No other park has coasters with layouts that are even similar to Kennywood's. The view down the cliff to the river. One of my favorite parts of the ride, the giant overbanked turn at the bottom of the cliff drop. The way it leads into another huge hill is just phenomenal. The new magnetic brakes done by Irvine-Ondrey really smoothed out the stop at the end of the ride. And my favorite wooden coaster in the park, the Jack Rabbit. The backseat jolt of airtime on this ride is as good as any other coaster I have ever experienced. The park's stunning Dentzel Carousel. A true work of art. The carvings are so beautiful and elegant. I hope the Roller Coaster Race becomes an annual event at the park. The event was so much fun.